Our apprenticeship aims to ensure that the skills of letter carving are kept alive and become a vital part of today’s art and memorial landscape. The apprenticeship runs for two years, offering students comprehensive, varied and inspirational training in all areas of letter design and letter carving. Eight apprenticeships, funded by the generosity of our Friends, patrons and supporters, have been completed successfully since the scheme was established in 2002. All our apprentices have become self-employed letter carvers. If you are interested in becoming a letter carving apprentice please see the application process at the bottom of this page. If you are interested in funding an apprenticeship, please visit our support section. Gaining basic skills in letter carving by the drawing and understanding of letterforms and the design and spacing of letters. Gaining competence using dummy and a chisel, combined with an understanding of the materials used – e.g. stone, slate or wood. Being inspired to become an avid learner and developing your own creative approach to the lettering arts. We want your apprenticeship to open up the many possibilities of letter carving. We want it to give you the confidence to carry out your new skills throughout your career, to inspire others, and to enjoy celebrating lives, events, and places for many years to come. 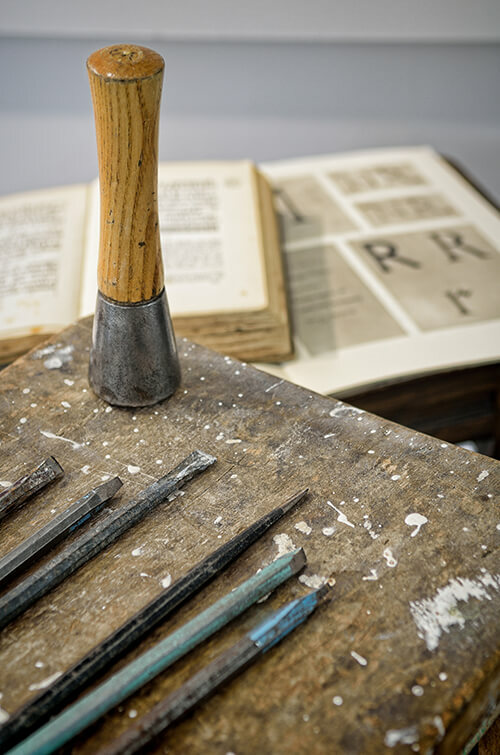 Once accepted as an apprentice, your training starts with a detailed study of the Roman alphabet, since drawing and carving letters are the main focus of the training. You’ll study historical examples of lettering, and pen, brush and experimental lettering will be explored. This will help you understand letterforms. As soon as possible, you will start to work on commissions under the guidance of a master letter carver. You’ll be involved in all aspects of the commission, from the first design to drawing out the work onto stone, to shaping the stone, to carving, and fixing. We put aside a set amount of time each week in the first year for one-to-one teaching. This is a good time to work out your own ideas. We can split the teaching throughout the week, or hold it in one block. The rest of the week is spent working on commissions, and tuition. We encourage you to keep a sketchbook, and to attend evening life drawing classes to improve your drawing skills. There will be occasional trips to museums to strengthen your historical knowledge and help keep your creativity bubbling away. We ask you to keep a detailed timesheet to record all work undertaken. We will assess your progress and development every three months. Please email us with as much information as you can: Your Current CV, a covering letter and Approximately 6 examples of your most recent work (please note, we only award apprenticeships as funds are available).